On Friday the smaller of the 6 ton dumpers suffered a puncture, and was replaced by a 9 ton one. Yesterday we received another delivery of type 1 material, which we duly dropped into the southern end of the 350m at Broadway north. Here you can see the type 1 material approaching the horse dock siding, so we are a long way up now. The newly discovered catch pit, next to the headshunt of the siding, is just visible on the right. Some of the rail from Childswickham can be seen behind; more was brought up today. This view, taken from the end of platform 1, shows that the full 350m stretch has now been part filled, but more needs to go in. The near end is contaminated with mud and in the picture is being scraped off for disposal. The Future Maintenance Facility will be installed on the horse dock siding under the white car. It will have a 9 inch thick base of concrete with two mats of reinforcing in it, with a concrete block wall behind. Two steel containers will be placed on top. 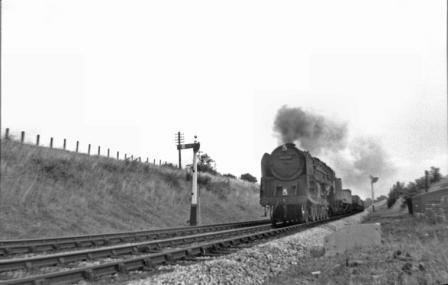 This is almost the same view from the end of the platform, but on 23rd August 1960. BR 9F 92214 is on a mixed freight, next to the old horse dock, which is already out of use. The horse dock was a popular spot for local schoolboys to stand, cop the numbers, and if they were lucky, take a photograph with a cheap camera. From the smoke you can see that this train was going at some lick. No ambling branch line trains on this railway, this was a double track main line, with main line speeds. The freight trains thundered through Broadway station, and shook the lights in the workers houses next door. Do you realise that the GWSR is the only preserved GWR main line? It makes us unique. What fun it would be to have a stretch of such double track somewhere along the line, to show what it was like. After further thought on the matter, it has been decided to lift the levels at the southern end a little higher still, so more material has to go in. Today we dealt with 6 lorry loads of track ballast, which we took down to the far end. The 9 tonner is seen here paused between the platform and a mini digger, which was parked a bit too close for comfort to the trackway that we are allowed to use. There are about 9 inches on each side, so 'dead slow' is the watchword. The steering on this old lady can best be described as 'woolly' (not like the pinsharp steering described in many modern road tests) and the reason it is so woolly is that it's the not just the wheels but the whole front end which is shoved in the desired (hoped for...) direction by two large hydraulic rams. The steering wheel with which you send your instructions never goes back to the same place twice, but sort of drifts round a 360 degree circle, any part of which could be the next starting point. But she can't half shift some stuff, between the two of us we moved 15 tons at a time. We reckon we have moved almost 1000 tons into Broadway north so far. This is the view at the end of today - perhaps a bit hard to see, but the rear end is track ballast (light grey) and the front end is type 1 (slightly more brown). We are here extending the track ballast towards the camera, reaching something over the half way point at lunch time, when we stopped. The end nearest the camera now needs another layer of type 1, which is the job for tomorrow. Wonderful progress with the ballast AND the share issue! I think by the time the share issue closes, you will have a comfortable working surplus. Let's hope so anyway. After all, there is the building on the other platform to fund as well as the current one on platform 1! I must 'take my hat off' to the P Way though, as you have worked through all sorts of inclement weather and many times far from civilization. Regards, Paul. As with St.Blazey, a great job and good news about the share issue. We got out share certificates yesterday, very impressive! Great to see ballast going in. Makes the whole thing look more like a railway somehow. Incidentally 92214, immaculate in BR green, is currently visiting "up the road," at the Severn Valley, so, maybe in a couple of years, you can re-create that shot! I compressed the photograph and have a (slightly) better one if the owners would like a copy. I'm sure the author won't mind that.